In the east of Sorrento you'll find the suburb "Meta di Sorrento" with the largest beach of the town. The suburb is located at the boarder of the peninsula near the mainland, therefore the coast is not as cliffy and one encounters a large and sandy coastline. Most tourists as well as the locals come here to spend a day at the beach, because there is enough space and one can also find a corner at the free beach or a sunbed at one of the many lidoes at a later time of day. Bars, restaurants and a boat rental ensure a fun day at the beach for the entire family. 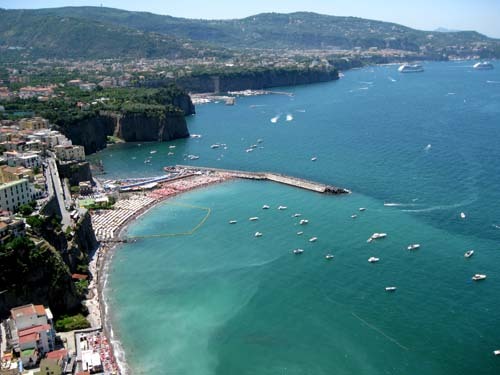 View at google maps "Largest and most popular beach of Sorrento with many lidoes in the district Meta di Sorrento"